People who enjoy my work at JanC Photography might also like the pictures from this blog. Its title says it all: The Best of Men. In February, The Best of Men featured an article about the blog you’re just reading. I’m not offering you a picture today but rather a whole site - actually a blog I discovered. The address is http://kraiziekatphotography.blogspot.com/ and you can also click on the Other Blogs of Interest button in the menu to go there. If you like JanC Photo you might enjoy Krazie Kat too. While waiting for all the new pictures to come, and there will be plenty of them, look at where it all happens, where pictures materialize. 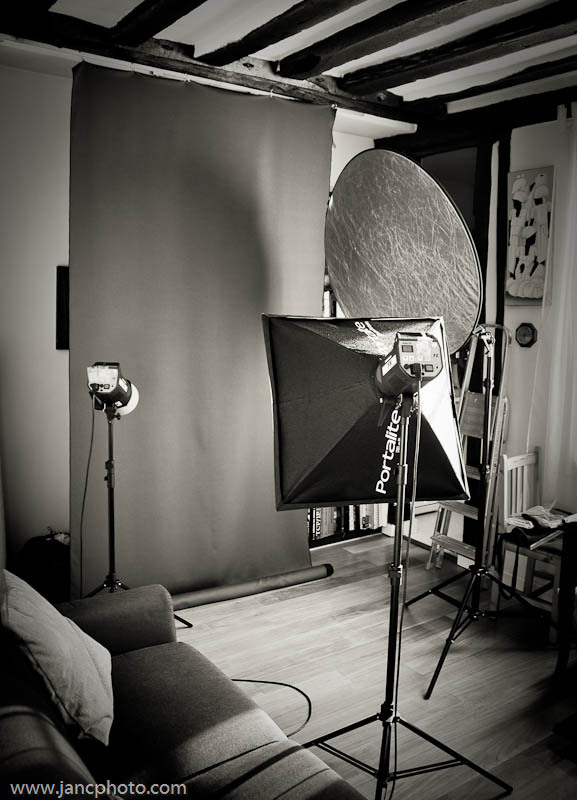 This is it, the JanC Photography studio in one of the possible setups with two Elinchrome strobes, one with a translucent lightbox and a large silver reflector. The backdrop is dark grey here.